Practitioners of yoga love to tout its benefits to others. You may have heard so many of them that you are actually sick of them. You live longer, you’re stronger, you have more flexibility, you stress less, and your blood pressure is lower. Some yogis will even tell you that yoga cures or prevents various diseases. Hearing it all can make some people roll their eyes and even go insane, as worshippers of yoga are sometimes downright annoying. On the other hand, if you have been struggling with your weight for a long time, have yet to start losing weight, or have stalled out in a weight loss regimen, then you might also be desperate to try anything to get some pounds off. If that’s the case, you might already be trying yoga, but are shocked to see that you’re not losing weight. Are you doing something wrong? Not necessarily. There are in fact a number of things beginner yogis should know if they are practicing in order to lose weight. First of all, you need to make sure that you are practicing the right kind of yoga. If you are attending studio classes, you likely have options of multiple kinds of classes that are available. The specific names might vary from studio to studio in order to reflect individual teachers and studio branding, but for the most part there’s three styles of yoga you can do. 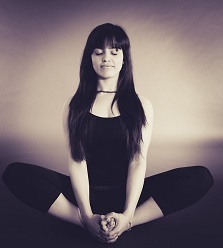 Yang classes, also called power or flow practices, feature very fast paced styles of yoga. Postures are done in sequences very quickly, usually to uptempo music and perhaps with extra heat added for increased sweat. On the other hand, there are yin classes that are slower, focusing on seated or still postures, in a more floor based class where students spend time in postures. In between the two are slow flow classes where there are sequences and flow between postures, but postures are still held for a moment or two before moving on. If you are learning at home, it’s a lot easier and cheaper, and there’s no one looking at you. However, videos can only go so far, as professional teachers can offer you support, encouragement, and most importantly, physical adjustments. They can also stand or sit beside you and show you how a pose is supposed to approximately look. Home videos are good for learning basics, but if you are serious about weight loss, then you eventually need to learn in-person from teachers. The deep stretch and yin classes don’t look like they will help you lose weight because they are so slow, still, and calm. There is a little truth to this, but not completely. The classes themselves won’t burn calories, but they will put you in a place where you can burn them later. Slow, still classes help you learn and master the basic poses. They also help rejuvenate and heal your body. This is where you need to make a decision. Do you use the slow classes as a springboard into the hot, sweaty classes? Or are they a counterpoint to other cardio activity that helps you burn weight? There is a simplicity in slowly working your yoga schedule up to include the power classes so you can sweat and detoxify your body. It’s a lot easier to stick with an exercise regimen that is all yoga, especially if you like the studio. If you do take this route though, you need to keep in mind that a power class doesn’t actually burn all that many calories. The amount that you sweat might even mislead you into thinking you’ve shed weight when you haven’t, and it’s critical you stay hydrated. Alternatively, use the restorative classes to keep your body agile and able to withstand the rigors of jogging, walking, biking, or whatever your heart fancies. Yoga doesn’t directly cause weight loss this way, but it does help you overall in losing weight. If you choose the slow flow classes, don’t be shocked if you actually gain a little weight at first. Since poses are held for lengths of time, muscle builds up. This is healthy weight to gain, as it’s the opposite of fat and boosts your metabolism and helps burn calories. There are two other indirect ways that yoga can help you lose weight. First, the stress management can help eliminate stress eating. Second, yoga practices can make you love your body and treat it better by eating healthier, even if you aren’t a stress eater. When you begin yoga, just getting on your mat might not burn calories, but depending on your path, it might lead to ways that you can lose weight.